The Marine Corps offers a diverse collection of jobs, and if you're fascinated by helicopters, this might be a position to consider. This job involves working with the CH-53 (superseded by the CH-53E) Marine helicopter, performing a variety of tasks relevant to the maintenance and operation of these heavy-lift transport helicopters. Helicopter crew chiefs, CH-53 are flight crewmembers that perform the duties incident to maintenance and operation of Marine CH-53 helicopters. This job requires a good deal of training, and interested individuals will start with the Aircrew Candidate School, receiving water rescue training and learning survival swimming. As part of the position's required training for all weather environments, you'll move on to Marine Aviation training, gaining depth of expertise in several areas, including aerial gunnery, heavy lift operations, night systems employment, and land and sea operations. (1) Must possess an MM score of 105 or higher. (2) Must have normal color perception. (3) Must be eligible for a secret security clearance. (4) Volunteer for duties involving flight as an aircraft crewmember. (5) Must be a 2d class swimmer or higher. (6) Meet the requirements of OPNAVINST 3710.7 and the USN Manual of the Medical Department with normal depth perception. (7) Complete the Naval Aviation Aircrewman Candidate School at NATTC, NAS Pensacola, FL. (8) Complete Survival, Evasion, Resistance, and Escape (SERE) School at Brunswick, ME. (9) Complete the appropriate formal (combined) "A" and "C" school, CH-53E Crew Chief Training Syllabus at CNATT MAR Unit, MCAS New River, NC. 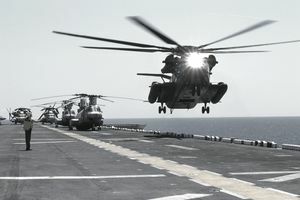 (10) Complete the appropriate formal "C" school, CH-53E Crew Chief Training Syllabus at CNATT MAR Unit, MCAS New River, NC. (11) Must complete the Plane Captain (PC) Ground syllabus for type aircraft. Working as a CH-53E crew chief, you would be providing global support for the Infantry as well as joint military operations around the world. If you like the challenge of working long days, often in austere environments, this position might be for you. For a complete listing of duties and tasks, refer to MCO P3500.14 and MCO P3500.50, Aviation Training and Readiness (T and R) Manual, and MCO P4790.20, Maintenance Training Management and Evaluation Program (MATMEP) for MOSs 61l3-6173.